Sweet Oakley came to us after his owners didn’t have the time to give him what he needed. 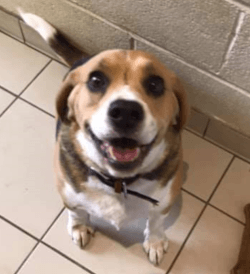 Oakley is a typical Beagle and is very energetic! He would need to go to experienced owners who have a lot of time to exercise him and give him the right training he needs. Beagles are very intelligent dogs and need plenty of enrichment and activities to keep them busy. Oakley is overweight so will need to be on a diet until he reaches his goal weight. Oakley is very sweet and would be a great addition to the right family.